It's strange to see people on the streets of New York and know that somewhere inside their heads they are thinking about the same thing as every other American. Remember the Towers! The sky-line will never be the same. We will never be the same. Rebuild in Peace. Our nation will become a stronger nation and we will overcome this tragic disaster. We will make it through this crisis. New York is strong. Nothing can stop us. Thank you to everyone who is helping in the rescue effort. God Bless everyone. LONDON (Reuters News, September 11, 2001) - In scenes worse than a disaster film, three hijacked passenger jets slammed into the World Trade Center and Pentagon on Tuesday killing untold numbers of people and robbing a nation and the world of its sense of safety. Trauma experts and psychologists said survivors of the catastrophe and relatives of those killed in the disaster would never be emotionally the same again. For millions of others who watched the carnage on television the harrowing images will be imprinted forever in their memory. This reference page was created in response to the events of Sept. 11, 2001. A decade later the world is more connected and still suffering greatly from both natural and made-made trauma. 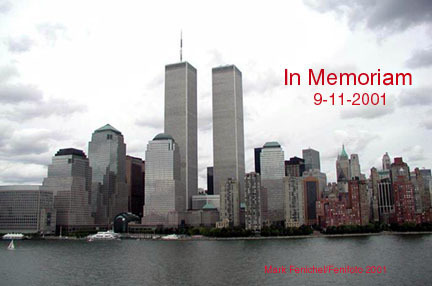 This small contribution was intended for mental health professionals, teachers, parents, and the "walking wounded" everywhere following the events of 9/11, in New York. The references which remain provide information on the general nature of trauma and the challenges of (human) recovery following disaster. Psychology: Resilience, hope, trauma, numbness and despair, interpersonal connections, altruism, love, anxiety and loss - all the elements so widely seen and felt in the aftermath of trauma and disaster. FEMA, Red Cross International, WHO, and other organizations offer specialized disaster response training, whereas these resources are meant for educational purposes only, and as tools for mental health professionals working with trauma. Having now witnessed traumatic experiences far beyond New York, from terrorism to tsunamis, in Africa, the Middle East, New Orleans, India, and Haiti, to name a few recent places with widespread trauma, it is clear there is a need to understand what is indeed normal when daily life is suddenly not normal. For those who wish to understand the nature of trauma or the reaction to it on Sept. 11, this page remains alive, as a tribute to hope and courage and human resiliency. An excellent overview of how a child's age affects response to disaster. From the NY State Education Department's Crisis Counseling Guide for children and families. From the NEA/HIN, an excellent guide to preparedness in schools. Separated into the 3 areas of readiness, response, and recovery. Plus a large collection of tools and resources for dealing with disaster. From the APA Task Force formed in 2002 "to develop information on psychological resilience, coping with disasters, and on programs that are most likely to help citizens deal with the stress, anxiety, and fear caused by terrorism.... [ Nine fact sheets ] intended to assist psychologists seeking to foster resilience in a variety of populations, including adults, children, first responders, mental health workers, military families, older adults, people of color, primary care providers, and the seriously mentally ill."
A basic, brief guide to understanding how children understand death, and grieve. An excellent discussion of what trauma is, how it impacts, and how it can be treated. From research in the wake of Hurricane Andrew to the aftermath of Sept. 11, to urban violence, an APA Monitor on Psychology report on one psychologist's findings of widespread PTSD among children. Praise for heroic teachers, guidance on emphasizing tolerance and a memo on emergency response plans. This is for mental health professionals engaged in assessment and treatment. The world has become "an alien place" for many, with lasting impact predicted. Authorative information from the WTC - survivor lists, etc. Excellent general guidelines for post-trauma work with children, accessible and practical. Some concrete suggestions for teachers working with grief in the classroom. Award winning site from psychologist David Baldwin. Many "handouts" and resources. As the U.S. news media was focused on moral dilemmas and steroids, in Red Lake Minnesota a teen killed a relative, took his police car, and proceeded to Red Lake High School where he went on a killing spree with his collection of guns and body armor. The reports were that despite his circumstances and many warning signs, nobody among his peers in that close-knit community, reported the talk about violence to authorities. Nine people died as a bright but troubled boy, coming to grips with culture and life, lashed out. His father committed suicide and his mother died in an accident. He shared his anguish and anger with a great many people online and f2f, before he began his rampage of death. Amazingly, this terrible event barely made the news, nor did it draw the attention of national leaders, as in the distant days of Columbine High School, when such violence captured America's attention for some years, and was seen as a symptom of a serious problem growing to epidemic proportions. Now it seems that violence among children has been crowded out by daily stories about war, morality, politics, and baseball. But this is real daily life for many adolescents in America. This is not new. Remember "Columbine High School"? Scroll down for the original focus of this page prior to Sept. 11, 2001: the growing alienation and anger and ease of acting upon it violently among teens. In 2000, APA and MTV were trying to spread the message: there are WARNING SIGNS!! Why is school violence emerging again? It is. October 2, 2006: Massacre in a one-room Amish Schoolhouse!! Were there no warning signs? What can we learn, and what can we do? Original articles and web-based resources for teens, educators, and practitioners. Articles and resources on the impact of school violence and other violence on children. Online information and brochures from the American Psychological Association's consumer Help Center. From the American Psychological Association, basic strategies, suggestions, and information for parents.